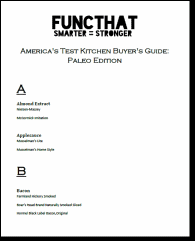 Alright my paleo/primal/ancestral eating peeps check it out: America’s Test Kitchen is known for their ridiculously thorough testing of products and recipes. They recently published a grocery store buying guide listing off the specific brands of grocery store goods which they found to have the best flavors/quality. Here at the FuncThat laboratory we reviewed the list and paired it down to only the items which your average caveman might enjoy. Bookmark this page for your next grocery store run and you’ll never again be left standing in front of a wall of olive oil wondering which is the best (FYI – It’s called “Colavita”). You can also download the PDF version to save for posterity or view the list online now. Bull’s-Eye Original (FuncThat Note: Pretty much the only BBQ sauce without high fructose corn syrup). BEST BUY (NON-REFRIGERATED, SHELF STABLE).